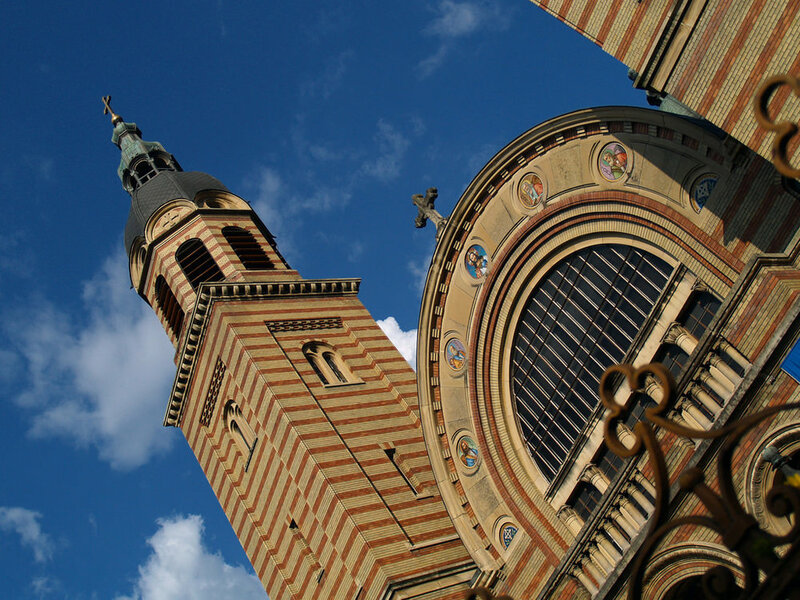 The Metropolitan Cathedral of Sibiu, dedicated to the Holy Trinity, was built between 1902 and 1906 to serve as the central church of the Archbishop of Sibiu and of the Metropolitan Bishop of Ardeal, a role it has fulfilled uninterruptedly from its completion to date. Its sober and elegant figure towers over the city of Sibiu, constantly attracting people of all colors, faiths and beliefs. It is not just a historical symbol of the city, but also a remarkable work of art, worth seeing and studying in detail for the extraordinary artistry of its architecture, decorations, paintings and even cult objects. The cathedral was erected in place of an older and smaller Greek church which had served, until then, as cathedral of the bishop. Some elements of that church were preserved and included in the new construction, such as the four wooden icons of the Virgin Mary and of Jesus Christ, plated with silver and framed in gems, which are currently part of the altar. Overall, though, the cathedral was built in Byzantine style, standing today as a small scale copy of the Hagia Sophia in Constantinopole. The issue of who should paint such a monumental and immensely significant cathedral made the object of a very heated debate. Out of 15 German, Hungarian and Romanian candidates, the constructors eventually chose Octavian Smigelschi, even though some priests were unhappy with him for being a Greek-Catholic. He painted the frescoes on the iconostasis, on the dome (illustrating Christ Pantocrator surrounded by angels), and on the dome pendentives in 1905. But he died before having completed the work, so, many years later, the painter Iosif Keber of Târgu Jiu was entrusted with the task of finalizing the painting of the church. The Metropolitan Cathedral of Sibiu is a magnificent construction, designed to accommodate about 1800 people at a time, which translates in an impressive size: it measures approximately 53 m in length, 25 m in width, with a 15 m diameter dome rising to 34 m and two towers 43 m high. Outside the cathedral is decorated with colored bricks, every five rows of yellow bricks being followed by three rows of red ones. The spacious nave is topped by several small spherical roofs, two small octagonal towers and two larger square towers, ending in an octagonal shape underneath the bell chamber. The ceiling above the main entry forms a wide semi-circular vestibule complete with stained glass windows and decorated in the top part with five mosaics executed in München. The interior of the cathedral is one of such breathtaking beauty and outstanding complexity that the visitors have trouble focusing on only one thing at a time. One of the most eye-catching items is the sculpted iconostasis made by Constantin Babic out of linden wood and plated with gold. Equally impressive are the golden chandelier, containing 76 light bulbs, the golden ark manufactured in Württemberg and the crosses on the two towers of the cathedral, reaching 1.5 m in height, manufactured in Sibiu but then taken to Wien to be plated in gold. The towers themselves contain four massive bells: the largest one, weighing 1,345 kg, was installed in the northern tower, and the other three in the southern one.